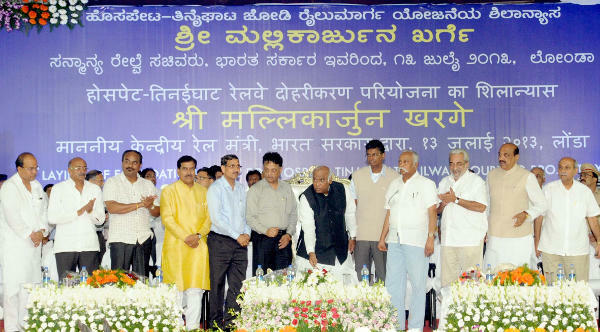 Shri Mallikarjun Kharge, Union Minister for Railways laid the Foundation Stone for DOUBLING OF RAILWAY LINE BETWEEN HOSPET-TINAIGHAT SECTION(245 Kms) a at Londa High School Grounds, LONDA. The Hospet-Hubli-Londa-Tinaighat (245 km) is a section of Bellary-Hospet-Vasco-da-gama route (407 kms) of South Western Railway. This was converted from Metre Gauge to Broad Gauge during 1997 and the section is saturated with current level of traffic. The railway line passes through Bellary, Koppal, Gadag, Dharwad, Belgaum and Uttara Kannada districts of Karnataka State. Bellary-Hospet region in Karnataka is the heart of Iron ore industry in the country. Iron ore is an important export commodity, earning valuable foreign exchange for the country. Iron ore from this region is transported to Chennai and Goa ports for export. The doubling of railway track is also necessary to move imported coal from Marmagao Port to the Steel industries and upcoming Thermal Power Plants in Jevargi In Gulbarga District, Thermal Expansion Phase-2 in Bellary Dist. in North Karnataka. Thus, it is important to increase the capacity of the existing Rail network to handle additional traffic demand necessary to sustain the country’s economic growth. The doubling will also increase number of passenger trains connecting important Tourist destinations like Goa in the west to the World heritage site of Hampi in the East and help in promoting tourism in the North Karnataka. Only foundation stone from some stones or will the work be started and completed. Time schedule ?